I love onions! This package is a mix of my favourites. There are 25 White - I love to pickle these and add them to side dishes. The 25 Red onions will be used this summer in my Greek salads. The 30 Yellow are perfect for everything, perogies and caramelized on flatbreads! This delicious mix is for very onion lover. 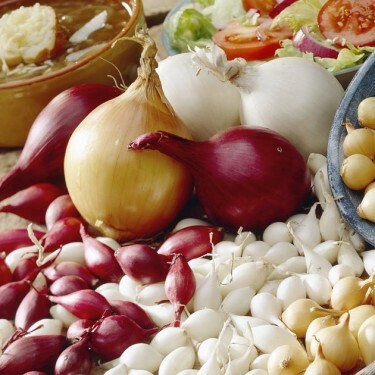 Grow 25 white, 25 red and 30 yellow onion and you’ll have enough onions in your pantry for months to come. The easiest and best way to grow your onions is to use 'sets' which are small bulbs that are planted in spring and grow into full-sized onions by summer's end. They are simple to plant and cultivate, often costing far less than plants and taking much less time and trouble than seeds. If you're trying to decide just how to grow your onions, bear in mind that most seasoned gardeners rely on sets! Onions need fertile, moist soil with good drainage. Onions have shallow root systems and therefore need frequent watering and careful weeding. As the onion matures its top will turn yellow then brown. Approximately two weeks later loosen the bulbs with a spade. In another two weeks they can be lifted and dried.